After three years of support, HERA Foundation is pleased to report the close out of Scholarship Recipient Shoulong Dong’s doctoral project. Shoulong’s R&D was focused on the development of an online engineering framework to aid engineers and researchers to carry out preliminary design exercises and performance evaluation. Developing an Expert Design Tool (EDT) as part of a past Industry Development program – AGGAT, which was focused on exploring the Organic Rankine Cycle (ORC). This support has resulted in the delivery of a beta version EDT to give potential ORC developers timely access to relevant data and information during early conceptual stages of design. Giving recommendations for technical based decisions – a step that in the long term avoids costly re-work during the build out phase. 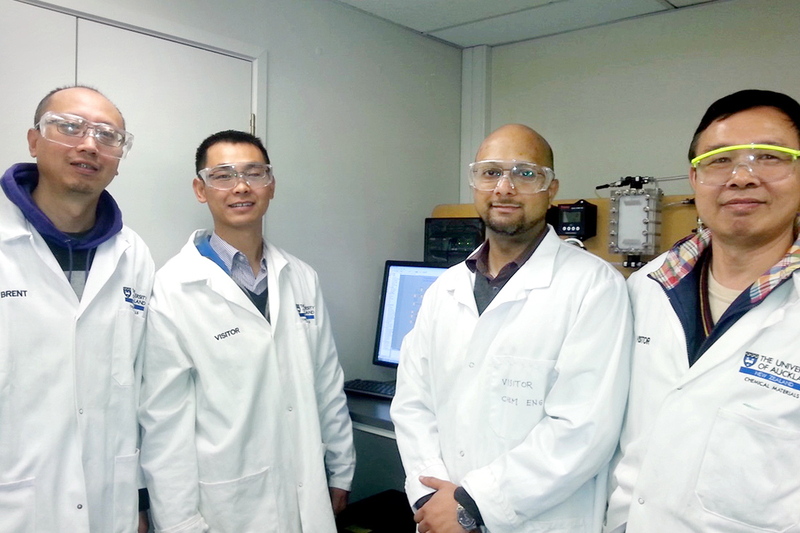 From left: University of Auckland Control System Lead Researcher Dr Wei Yu, HERA Foundation Scholarship Recipient Shoulong Dong, our General Manager Industry Development Dr Boaz Habib, and University of Auckland Controls Technician Frank Wu at the Process Control lab facility at the university. ORC has long been considered a promising technology for converting low-grade heat sources into electricity. This is an exciting prospect given the increasing demand to reduce fossil fuel reliance and embrace renewable energy resources. However, the ORC design is a knowledge-intensive procedure with a variety of design variables and operation constraints that normally need large-scale expert interventions. From 2012 to 2017, HERA ran a R&D project to explore the potential ORC might hold for our NZ metals industry. Facilitating a team of experts, universities and industry partners both nationally and abroad to look into the opportunity further. During this time, creating an internal controls research team with the University of Auckland (of which Shoulong was a part of). This team was focused on developing control logic and process control models, and up until December 2018 Shoulong continued to receive scholarship support as part of our commitment to his doctorate deliverable’s. This project involved several aspects, such as expertise extraction, modeling and simulation, algorithm development, and software integration. The expertise came from several research domains including turbines, heat transfer, control systems, materials/fluids selection and process configurations. Different component models were developed and validated in order to simulate various ORC processes and evaluate their performance. And, artificial intelligence approaches and optimisation algorithms were proposed and implemented to support the decision-making during the ORC design procedure. Different modules were then integrated and deployed under a Python programming environment. For HERA and it’s AGGAT program at the time, this project was about creating a user-friendly design tool for members involved in ORC development in New Zealand. Enabling greater uptake of ORC design capability in our membership and ultimately a competitive design offering as an industry in the energy sector. “Moving forward I’ll be working on developing an ontology for ORC design. It’s a novel attempt in this field aimed at identifying all relevant concepts and their relationships in order for knowledge exchange, reuse, and management to occur. I also have two more journal papers planned for completion in the following few months,” he said.